This Notebook PC wants to be so much more than a smaller netbook or Chromebook and actually nabs a few design tricks from high-end Asus ultrabooks like the Asus Zenbook UX21E. Taking on a luxury domain happily inhabited by the Sony Vaio range as well as the entry level MacBook Air, the £449 price tag is appealing and costs even less online - but are there any corners cut or does it have what it takes to make it into our list of the best laptops around? 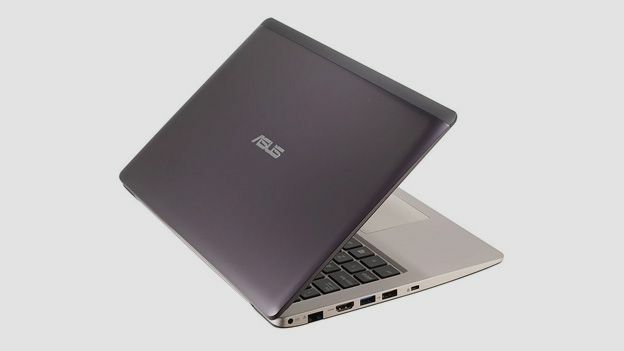 The brushed aluminum interior shares a similar design to high-end Asus ultrabooks but the exterior is a smart, dark plastic and rubber underside rather than the silver glamour you see when the S200 is opened. Keyboard and trackpad are both responsive and premium. There are two side speakers and just one grill for ventilation, which means the S200 can get hot on your lap but it's very quiet. The bezel around the screen is huge, however - thicker than an iPad 4 surround and the screen is very reflective too. A lacklustre i3 processor powers the S200, alongside 4GB RAM and a respectable 500GB hard drive and HD 4000 graphics chip. There are three USB sockets, HDMI out, headphone socket and a SD card slot alongside some neat lights on the bottom right of the keyboard which show power, Wi-Fi and hard drive status. The spec isn't amazing and we're puzzled by the 1.41 kg weight (and 22mm thickness) given that the screen is 11.6 inches. The 11.6-inch 1366 x 768 pixel resolution display is dim at times but responsive for touchscreen based Windows 8 needs. It is overly reflective compared to the glass of rival machines which do away with such glare issues. It's one area that the S200 falls down but, used at home, the problem is less of an issue - on the train or at your local cafe, however, it proves an irritating problem. The i3 processor isn't really up to powering Windows 8 apps. Basic browsing and Word works well but ask much more and things begin to chug and apps take a while to open. The touchscreen is responsive however and the hard drive might be a 500GB old school system rather than a 128GB SSD drive found on rival machines, but it works well. The standout brilliance of the keyboard and trackpad make typing and browsing a joy, especially given the space allocated to the keyboard itself. We managed 3 hours of heavy use, which is disappointing for a notebook - slimmer, lighter ultrabooks such as the Acer Aspire S3 offer more battery life with a full size screen and ultrabook processing speeds. The Asus is small but heavy, premium but with budget shortfalls - overall, it's a compromise for the price tag. We love the keyboard and design once open, but the lacklustre screen does disappoint. A MacBook Air is twice the price but, tellingly, Ultrabooks are now around the £500 mark with an i5 processor, bigger better screens and lighter frames. The Acer Aspire S3 is just one example which leaves us considering smaller, cheaper netbooks or budget ultrabooks over this Notebook which tries hard to bring Windows 8 skills at a budget price but falls at crucial hurdles - 3 hour battery life is poor and the weight is unappealing given the screen size. Great price is money is tight, though.